Ever wonder why there aren’t more women business-owned millionaires in the world? Lisa Belkin has, and thought enough about it to write an article for the New York Times. My good friend Linda Childs sent me her article, thinking I would be interested in sharing it with my readers, and she was right -- thank you Linda! A Capital Idea for Women addresses the little talked about statistics about how women-owned businesses are struggling to get past the $50,000 revenue mark and having great difficulty getting to the $1 million revenue mark. Women are starting businesses in the United States at twice the rate of men. According to the Center for Women’s Business Research, there are 10.4 million women-owned businesses nationwide. 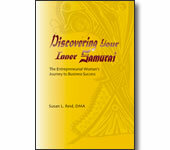 • About 43% or all women-owned businesses have revenue of $10,000 or less per year. • Over 70% have revenue of less than $50,000. • Only 3% have revenue over $1 million. As a small business start-up coach and consultant, I've identified two things that keeps women from reaching the $50,000 mark. 1. Women throw in the towel too early. 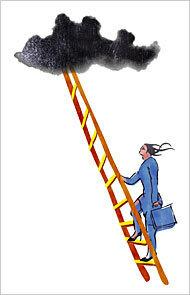 Everyone faces challenges, difficulties, and fears when starting up their business. Everyone hits the proverbial wall of resistance and has to make a decision about whether they should quit and throw in the towel, or persevere and move forward. Not knowing about the heroine's process and journey causes women to throw in the towel pre-maturely. 2. Women take business challenges personally. When faced with a business problem, men tend to look at what is wrong with their business and what they could fix about their business. Women, on the other hand, tend to look at what’s wrong with them and what needs to be fixed about them. Not knowing how to trust their inner knowing and listen to their Inner Samurai "yes" and "no" pulse causes women to flounder in decision making situations. So what do you think either about Lisa's ideas put forth in her article, or about my ideas about why women-owned businesses are struggling to reach the $1 million dollar mark? It's unfortunate that only 43% of women business owners earn less than 10,000. It's difficult for mothers and women to overcome the gender gap, as well as their duties to their children. Fortunately, I think women are slowly evolving and working harder to bridge the gap and be even more successful business owners. If you're having a hard time getting your business over the next hump, it may be time for a loan or funding to grow it to the next level. There's this really great contest that I found called “Make Your Dreams Come True with Mirassou.” that may help out. They are awarding one aspiring business woman $50,000 plus a team of highly professional consultants to help kick start your business. Check it out here http://www.mirassou.com/women_in_business/dreams.asp for more info and to enter. It would be a great asset for you future female leaders of tomorrow. I work with them, so I have the inside scoop. You are so right, Glenda. It is difficult and frustrating for North American women who are wanting to be successful business owners to bring in the kind of money they need to raise and support themselves and their families. I appreciate you offering an opportunity for women to get some start-up funding and support consultants to help women get ahead. Best wishes and great success for all you do.